The face-on spiral galaxy M101, or the Pinwheel Galaxy, is seen at ultraviolet and optical wavelengths in this image taken by ESA’s XMM-Newton space telescope. The picture is composed of images taken by XMM-Newton’s Optical Monitor telescope using different filters: red (200–400 nm), green (200–300 nm) and blue (175–275 nm). 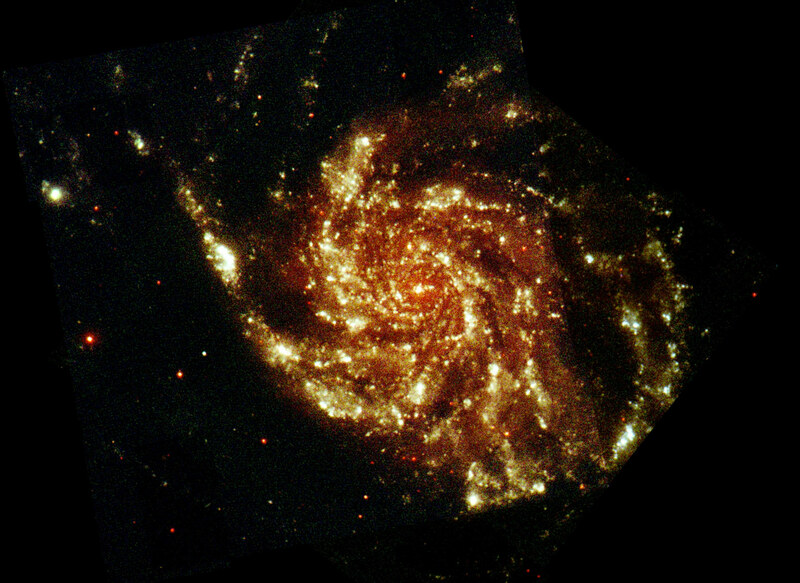 First published in the XMM-Newton image gallery in 2002, this view of M101 was composed of images taken by XMM-Newton’s Optical Monitor telescope using different filters and is still popular among astronomy fans today. Also known as M101, the galaxy lies 21 million light-years away in the constellation Ursa Major. It measures 170,000 light-years across – nearly twice the diameter of our own Milky Way Galaxy – and contains at least a trillion stars. About a billion of these stars could be similar to our own Sun. More often seen in visible light, here the Pinwheel Galaxy glows at ultraviolet wavelengths. Massive, hot young stars streaming with ultraviolet radiation mark out the galaxy’s spiral arms with bright pockets of forming stars. Since the largest stars are the shortest lived, with a maximum lifespan of a few million years, studying the ultraviolet radiation being emitted by a distant galaxy is a good way to measure how much star formation is taking place within it – and it is clear that M101 is still very active. The galaxy has also borne witness to the death of stars, with four supernova explosions recorded between 1909 and 2011. The Pinwheel Galaxy appears slightly lopsided, its arms wound tightly around the central bulge on one side but more loosely bound on the other. Its architecture is likely due to interactions with other galaxies earlier in its history, their gravitational attraction pushing and pulling M101’s arms in new directions. This view of M101 is composed of images taken by XMM-Newton’s Optical Monitor telescope using different filters: red, green and blue. 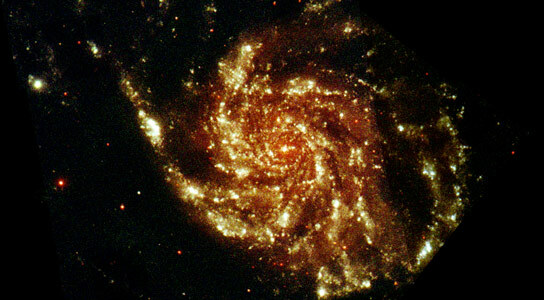 1 Comment on "Pinwheel Spiral Galaxy M101"
Interesting. To me it looks like something massive has cut right through the galaxy on at about 100 degrees and taken out much of the front part of the right hand side.